Patronus introduces copy control encapsulation in areas of the disc not read by DVD players during playback. Complying with the DVD standard, the original content is not modified and play-back quality remains unaffected. Patronus effectively controls access to the content by common ripping programs and provides effective, speed bump protection from unauthorised copying. The result is copy-controlled discs with playability matching that of unprotected DVDRs. Complex content – including menus, special features, extras and even dual layers – are protected by the passive technology of Patronus, which ensures no changes are made to the original video files during analysis. Patronus provides an ideal solution for consumer ‘download-to-own’ and in-store ‘on demand’ manufacturing. Fortium ’s DVD Anti Rip Copy Protection technology is designed with reliable levels of protection from mass market ripping programs. Patronus provides effective speed bump protection from unauthorised casual copying. Patronus software is regularly tested against new and upgraded ripping programs. 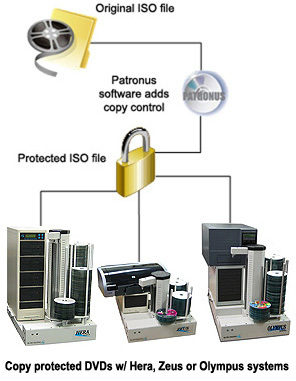 Patronus protected DVDs have full playability designed to match playability levels of unprotected DVDRs in DVD players. The original media content is not modified and play-back quality remains unaffected. This is achieved by introducing copy control encapsulation in areas of the disc that are not read by DVD players during playback. Independent testing confirms that Patronus protected DVDs play in all DVD players that play DVDRs.